Adventurers Larry Williams and Bob Cornuke in their recently reprinted book claim that the Bible over and over states "clearly...that Mount Sinai is in Arabia" 1 -- an admittedly crucial point "upon which the thrust of our argument will fall" if disproved Biblically.2 Howard Blum has retold their story in a new book, The Gold of Exodus, published by Simon & Schuster (1998), and Cornuke has now come out with his own separate book (2000). There is a certain amount of irony if not implausibility in their argument which in essence tries to take Mt. Sinai out of the Sinai. What they mean by "Arabia" is modern Saudi Arabia and there is no statement in the Bible or any other ancient source that places Mt. Sinai in Saudi Arabia by whatever ancient name (in this case Midian). In fact, it is quite the reverse, Mt. Sinai is clearly placed outside of Saudi Arabia and right on the Sinai Peninsula as we would expect. Exodus 18:27 states that, while the Israelites were camped near Mt. Sinai,3 Moses sent his Midianite (Saudi Arabian) father-in-law Jethro back to"his own country" of Midian (NIV, emphasis added). Clearly, Mt. Sinai and northwestern Saudi Arabia (Midian) were in two different locations. The making of the statement signals the importance of the action, it was not a trivial event or insignificant journey for Jethro to go back to Midian from Mt. Sinai. This incident was repeated about a year hence on a later visit to Mt. Sinai by Moses' Midianite father-in-law or nephew Hobab (Numbers 10:29-31). Moses asked him to stay and guide the Israelites to the Promised Land, but he declined, saying he would return to "my own land" (Midian) and "my own people" (Midianites) from Mt. Sinai. (NIV, emphasis added) He did not want to go on a long journey to Moses' land with Moses' people. Hobab's land (in what is modern Saudi Arabia) was clearly not the same land where they were at (Mt. 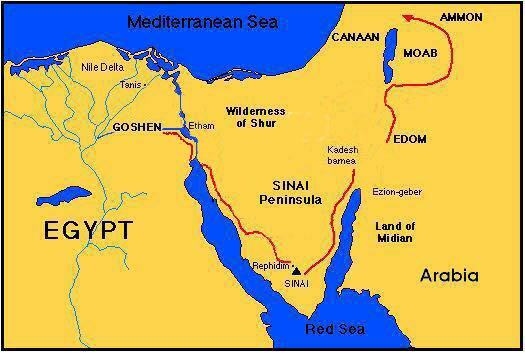 Sinai) and not the same land where they were going (Canaan), which were national or geopolitical entities spread across a great distance and requiring an expert guide to navigate. The only response to these difficult arguments from the Bible has been to suggest that everything was really happening at Mt. Sinai in Midianite Saudi Arabia and that Hobab merely meant that he was going back to his own tent nearby, which trivializes the watershed decision and is frankly absurd. If this conversation at Mt. Sinai was really taking place already in Hobab's homeland of Midian among his people the Midianites then Hobab would have said to Moses "You go on your journey but I am staying here in my land with my people." Hobab obviously did not say that. It was a parting of ways with the two going their separate routes. Another variation of this back-to-his-tent counterargument tries to split the difference and elevates Hobab's tent to a city. But that makes no sense either, the verses are not talking about Moses going to his own city (the Promised "City" instead of Promised Land?) and Hobab going back to his own city. This devastating Biblical disproof of Sinai-in-Arabia was first made in a book that Williams and Cornuke quote and use as an important reference, yet they never mention the disproof to their readers. It was in Prof. Menashe Har-El's 1983 book The Sinai Journeys: The Route of the Exodus. It was again repeated to Cornuke and Williams in Dec. 1996 when the draft of this article was presented to them in advance of publication on this website in Jan. 1997 and again there was no response, though one was promised in writing. Four years later an unofficial rebuttal has been presented privately but hasn't been made public as of this date. The latest desperate effort to save Sinai-in-Arabia, the back-to-the-city theory, was in Bible Review magazine for April 2000. The suggestion is that "Midian" was a city and that Mt. Sinai was close by, thus supposedly solving the problem of the Bible verses in Exodus 18 and Numbers 10, which we just reviewed (above), and again putting Mt. Sinai in Saudi Arabia. However, this flies in the face of the passages in Exodus and Numbers that clearly indicate that Midian was a land not a city and that it was a substantial distance from Mt. Sinai requiring a special effort by Jethro to send word back and forth and to come out and meet Moses (Exod. 18:1, 5-7). There may have been a capital city of Midian with the same name as the land (as indicated in a few places in the Septuagint Greek translation of the Bible) and this was often the case with ancient nations and their capitals. But it is irrelevant to the circumstances in the Bible describing the land of Midian not a city. As previously noted, if Midian was a city near Mt. Sinai then Hobab should have told Moses he was staying where he was when the Israelites set out for the Promised Land, instead of saying he was returning to his own land (Num. 10:30). If Midian was a city near Mt. Sinai then it was effectively the same location in Biblical terms and so Hobab would have stayed and waved to Moses and the Israelites as they left him behind. Bible archaeologist Gordon Franz has published an outstanding critique of the Sinai-in-Arabia theory in the most recent issue of Bible and Spade journal for Fall 2000, published in February 2001, by the Associates for Biblical Research (see website at http://christiananswers.net/abr/abrhome.html). Franz thoroughly reviews the archaeological evidence of the Jebel al-Lawz site and its surroundings, and the lack of evidence for the Israelites. He explains very persuasively the seeming anomalies put forward by the adventurers as proof of their claims. He also has learned that the official Saudi archaeologist is soon to release an exhaustive site analysis in a formal archaeological survey report. JOSEPHUS: "Moses went up to a mountain that lay between Egypt and Arabia, which was called Sinai...."
It has been suggested in rebuttal that Josephus was here quoting Apion whom he was attacking, so therefore everything Apion said was a lie. This is a desperate and absurd argument. Josephus merely objected to a discrepancy in Apion's account of the Israelites' Exodus about the number of days of travel versus remaining camped, and evidently agreed with this statement of Mt. Sinai's location "between Egypt and Arabia" otherwise he would either have attacked it as well (especially since it had bearing on the travel time issue) or he would not have quoted it in the first place. Moreover, how on earth did Apion in ca. 40 B.C. even get the idea that Mt. Sinai was, well, in the Sinai, if as Williams and Cornuke allege, this was actually a fabrication of the 18th century designed as a "tourist scam" to attract visitors to the traditional site at St. Catherine's monastery? Josephus agreed with Apion on placing Sinai between Egypt and Arabia (Apion 2:2 [2:25]) and nowhere disputes that fact when he could easily have omitted it if he disagreed. Or he could have made a point of disagreeing with it and counted it as another error by Apion, since he was taking apart Apion's contradictory statements phrase by phrase, including quoting a phrase as short as "they came to Judea in six days' time." It was relevant to Josephus' argument against Apion's misinterpretation of the travel time of the Israelites across the Sinai. The full context shows that Josephus had disputed Apion's slur that claimed the Jews' Sabbath was due to their taking 6 days to reach Judea from Egypt then resting on the 7th day because of groin disease. Josephus disputed this slur by pointing out, among other things, a self-contradiction where Apion elsewhere had said the Jews had taken at least 40 days to cross the Sinai by stopping at Mt Sinai for 40 days "between Egypt and Arabia," which statement Josephus agreed with. If Josephus did not agree that Sinai was "between Egypt and Arabia" but thought that Sinai was in Arabia he should have said so and racked it up as another gross error by Apion, or just omitted that altogether if the only issue was the 6 days vs. the 40 days travel. But he didn't. Placing Mt. Sinai somewhere in Arabia is not new, contrary to what has been implied by Williams and Cornuke, but the specification of a particular mountain is relatively recent. The general idea goes back to about 1225 AD, when Muslim geographers began to arbitrarily shift Biblical place names  largely because they had been identified by Christians  from the Sinai to Arabia, as a kind of polemic against the Crusades. But this Mt. Sinai-in-Arabia concept was purely a product of scholarly theories and propaganda, not of long-standing local traditions which often can preserve genuine information about ancient geography and Biblical sites. (10) Nor does not compare in antiquity with the traditions attached to the southern Sinai Peninsula, which can be traced back to about 100 A.D. The specific Jebel al-Lawz site for Mt. Sinai has been occasionally indicated in some scholarly references as a possibility, going back at least two decades prior to the Williams-Cornuke and Blum books. Such references include a map published in an encyclopedia in 1972, a map in the Har-El book published in 1983 (used by Williams-Cornuke without credit for the site location), maps in two popular books in 1975 and 1985, and in a well-known archaeology magazine in 1977. (14) None of these sources give any documentation that the Jebel al-Lawz site had a genuine local geographic tradition as Mt. Sinai. No early map or reference has been cited specifically giving Jebel al-Lawz the name "Jebel Musa" ("Mountain of Moses" in Arabic). The only evidence is stories allegedly told Williams and Cornuke by local residents and not even claimed by the locals to have come from ancient tradition and is not documented from ancient sources. 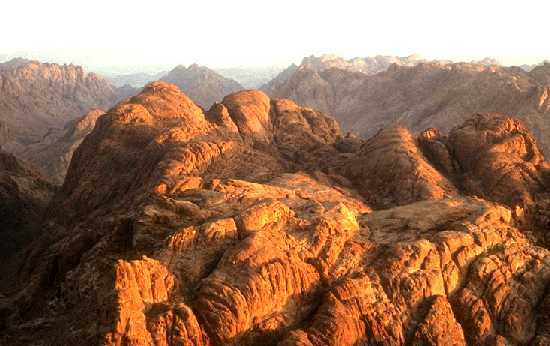 (15) The name "Jebel Musa" remains strongly attached to the traditional site near St. Catherine's monastery, as it has for nearly 2,000 years (see next section). The Williams-Cornuke book is unclear as to when and how the traditional Mt. Sinai was supposedly picked, and this of course has a bearing on how substantial and legitimate a geographic tradition it is. An unnamed "psychic or seer" is said to be responsible for choosing the traditional Sinai site for Emperor Constantine (plate 7 caption of the book). But elsewhere their book says this "myth" has arisen only within the last "almost 250 years" as a long-running "tourist scam," and "prior to that time [about 1740], numerous other mountains were claimed" to be Mt. Sinai though no example is given (pp. 17, 50) and the claim is patently false. The current book likewise attributes the traditional Red Sea crossing site at the Gulf of Suez to an unnamed 16th century "mystic who claimed she had a revelation" (pp. 140-141). In Apostle Paul's time, "Arabia" covered a wide area that "included the Sinai Peninsula" as well as what we now call Saudi Arabia, according to Cambridge scholar Graham Davies. (27) A glance at most Bible atlases will show this. Thus, Paul's remark in Galatians 4:25 is quite consistent with Mt. Sinai's traditional placement on the Sinai Peninsula. One investigator of the Jebel al-Lawz site states he discovered the gold from the Golden Calf there using a "molecular frequency generator" (p. 107), which one knowledgeable source (Dr. John Morris) says is actually a dowsing or divination rod. (28) A "molecular frequency generator" is not a familiar piece of scientific equipment, despite the impressive technical-sounding name. The current book refers to site surveying by "pendulums" (p. 75), another form of dowsing. The Bible cautions against such practices (Deut. 18:10-11; Levit. 19:26, 20:27) or consulting those who use them. (Levit. 19:31; Deut. 18:14). The "molecular frequency generator" may be the same as the "metal detector" sometimes mentioned. (29) However, the metal detector's reported detection of gold from a distance of two miles seems to be an impossible range for the usual electromagnetic induction metal detectors, which are limited to a maximum range of just a few feet. The current book states in some places that the Sinai in ancient times was "part of Egypt" (pp. 26, 58). We can call this the "Sinai/Egypt" territory for simplicity. If so, this would prove that Mt. Sinai was not on the Sinai peninsula because the Israelites would have to leave this "Sinai/Egypt" territory in order to be totally free of Egypt and then to travel to the holy mountain. The book quotes the Father of Modern Archaeology, William Flinders Petrie, to support this point (p. 56). But the Petrie quote in the book actually states the exact opposite, that the southern Sinai was, quote "outside the territorial border of Egypt"! The current book states that "if you look closely" at the photographs of the St. Catherine's area "you will see there is no vegetation" (pp. 60-61). But there is an oasis behind St. Catherine's and looking closely one can see the tops of trees towering over the back wall of the monastery even in Plate 7 of the book. The book states (p. 62): "I don't think there is anyone who will contest that it is impossible to graze a flock of sheep at the base of the supposed Mount Sinai [Jebel Musa]." But the Grollenberg Atlas of the Bible has a large photo of just such a flock of sheep grazing at the base of Jebel Musa, the traditional Mt. Sinai, in the plain of Er-Rahah. (32) The shrubbery looks exactly like the vegetation in the photos of the Jebel al-Lawz site (plate 21), which is praised in the book as excellent pasturage and "totally different" from the supposedly barren traditional site in the Sinai (pp. 66, 158-159). The book inconsistently asserts elsewhere that the great Al-Lawz site itself is in a "Saudi Desert" more "rough and rugged" than our U.S. Southwest and is "dry and uninhabitable" (p. 152). Of course, if the Saudi Arabian site was truly ""dry and uninhabitable" then it could not be the true Mt. Sinai, could it? Petrie's student and scholar, Lina Eckenstein, in her History of Sinai, has also described the "reckless deforestation...which has gone on unchecked for thousands of years," turning a Sinai of "great fruitfulness" into a vast wasteland. Forests once covered the Sinai valleys. Proof of the heavy forests can be found in the massive, possibly 100,000 tons, of slag-heaps left from the copper smelted by burning huge loads of wood in the Sinai's Wadi Nasb, and in the "great bed of ashes" from sacrifices burned with tons of wood at the mines of Serabit el-Khadem. (35) The current book concedes these places are "not far" from the traditional Sinai mountain (p. 54). The book argues that Moses could not have wandered outside of Saudi Arabia when he found the Burning Bush at Mt. Sinai because Moses was like the Midianites who "were not nomads but, in fact, were a sedentary culture; they didn't move around, they stayed in one place. They stayed in Midian, which is now associated with Saudi Arabia." (p. 16) But then the book actually quotes two of its leading reference works (pp. 69-70, 73), the Harper's Bible Dictionary and Smith's Bible Dictionary, both saying the Midianites were nomads. The Bible reports Midianites traveling long distances into Egypt for trade (Gen. 37:28, 36) and into Western and Northern Israel for war (Judges 6-8). Like his Midianite hosts, Moses could have wandered far outside of Midian in reaching Mt. Sinai. In fact, the Bible seems to say just that: In Exodus 3:1, where Moses is said to have "led" Jethro's flock to Horeb (Mt. Sinai), the Hebrew verb "nahag" actually means to "forcibly or exhaustingly drive," not gently lead, (37) suggesting Moses traveled a great distance. At first, the book correctly reads Exodus 3:1 to mean Mt. Sinai must be WEST of the wilderness. The book states that the Jebel al-Lawz site for Mt. Sinai in Saudi Arabia meets this condition (p. 62). 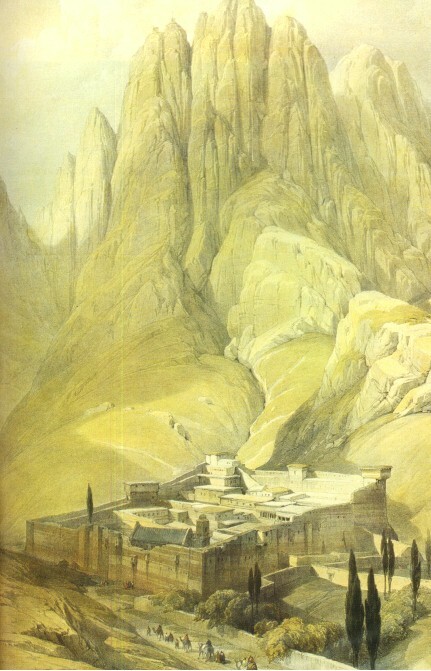 But elsewhere the book claims the al-Lawz mountain lies to the EAST of the wilderness (p. 99). Geologist Dr. John Morris told me the Jebel al-Lawz rock he examined is normal metamorphic rock typical for the volcanic area it came from, there was nothing strange about it nor any sign of plants melted into the rock. (40) The book does not mention that Jebel al-Lawz is in a volcanic region. The current book seems to refer to various cut and polished stones as related to the Exodus, yet occasionally admitting they are of much later date (pp. 97, 217). The Israelites were not allowed to cut the stones (Exodus 20:25; Deut. 27:5). The book insists that when Moses built an altar for burnt offerings and fellowship offerings, at Mt. Sinai (Exodus 24:4) it was made of STONE. The Bible then qualifies the instructions for future circumstances at other locations that, "Wherever I cause my name to be honored, I will come to you and bless you. if you make an altar of stones for me, do not build it with dressed stones, for you will defile it if you use a tool on it." (Exodus 20:24-25, emphasis added.) Later, the Israelites did indeed build such an uncut stone altar, but in the Promised Land of Canaan, not Sinai (Deut. 27:5; Joshua 8:31). The book author states, "I seriously doubt that an altar of earth would have survived all these years" (p. 75, emphasis added). But at another place he almost seems to admit the altar on Sinai was made of earth and long since destroyed (see p. 96). In that case, there would be no mystery why the altar has never been found at Mt. Sinai. One flash flood might have washed it away in an instant. (41) Over the centuries surely nothing would be left. The book states that after many centuries of people searching for Mosesaltar (Exodus 24:4) at the traditional Mt. Sinai, "no one has found anything remotely resembling" it. Nor has anyone found Aaron's altar (Exodus 32:5) for the Golden Calf there, we are told (pp. 75-76). But travelers long ago, such as Egeria again, found what they thought were stone altars built by Moses and Aaron. (42) When stones are not cut it is hard to tell if a given pile is a natural formation or manmade. So, whether travelers were right or wrong in their observations of landscape or in their interpretations of Scripture, it is not quite correct to say that absolutely nothing has ever been thought found at the traditional Sinai. Because it is certainly not correct that no one has ever "claimed , or even discussed" the possible finding of altars there as the book insists (p. 109). As for the survival of the 12 pillars of Moses at Mt. Sinai (Exodus 24:4), the book author finds it "difficult to comprehend that a mountain as important as this one would be defaced" or that its stones would be "whisked away by someone" (p. 75). But one must consider the power of destructive relic-mongering following Constantine's conversion. After Helena's pilgrimage Mt. Sinai "was becoming one of the most favored Christian [pilgrimage] sites." (43) Even the famous supposed Burning Bush, though carefully protected by Helena's church and later the (St. Catherine's) fortress monastery, did not survive. By 1216, it was gone, having been taken by relic-seekers. (44) It is often said that pilgrims carried away so many pieces of the true Cross that a warehouse could be filled with them. It is most likely the 12 pillars set up by Moses have been disturbed or removed through the ages so that they are not recognizable as 12 stones set aside in one defined place. Since only one or two of the "rings" were barely visible from under the dirt and rock, and none of this debris was cleared, it is difficult to see how one can know if any other such "pillars" existed or that there are exactly 12 of them. The smooth marble pillars at Jebel al-Lawz are most likely Nabatean. Recall the spectacular ruins of Petra as seen in the recent popular movie "Indiana Jones and the Last Crusade." The huge marble-columned Nabatean temple at Petra, ca. 40 A.D., (46) appears "out in the middle of nowhere," to paraphrase the current book. The unexpected appearance of such products of high civilization in a remote place is not proof of a link with the Exodus. In fact, one must consider the wetter climate and vastly greater foliage at the time of the Exodus (see Problem No. 8, above). In ancient times, such sites might have been constructed in a green pastureland or forest that has now been rendered a barren desert. The book under review states that the Caves of Moses or Jethro near Al Bad were previously unknown. Many people in Saudi Arabia were contacted in an effort to find an archaeological site list showing these caves, but nothing was found (p. 183). "There appears to be no research on or explanation of this site in any Arabic literature," according to the caption to Plate 19 of the book. None of the alleged satellite photos that are supposed to show the ancient Israelite marching trails and campsites along the Exodus route (pp. 220-221) have been published as far as I know. This makes it difficult to study the assertions that have been based on the photos, or even to verify whether the photos exist. The book asserts that the Israelites...trail can be followed in the (unpublished) satellite photos from the Sinai peninsula, then into Saudi Arabia, and it "just disperses" at the Jebel al-Lawz site, the claimed Mt. Sinai. "It does not continue on in any one direction" from Jebel al-Lawz (pp. 220-221). The explanation is that from Mt. Sinai the Israelites supposedly started their aimless wandering in the wilderness for 40 years (see p. 57). However, there is a misconception and misreading of the Bible here as the Israelites did march on in "one direction" from Mt. Sinai. It was to Kadesh Barnea, from where they sent out the spies into the Promised Land. Only at Kadesh-Barnea were they condemned to wander in the wilderness for the next 38 years (Deut. 2:14) for their rebellion, not at Mt. Sinai. (Deut. 1:19-2:1; 9:23; Numbers 10:12, 33; 13:26; 14:25.) If the real Mt. Sinai is at Jebel al-Lawz then there must be a continuation of the trail at least to Kadesh Barnea. But admittedly there isn't. No satellite pictures are shown of the allegedly inferior trails around the traditional Mt. Sinai. No scientific explanation is given, or technical reference cited, for the "high-tech space photography" method of precisely dating these traditional-site trails at only "300 or 400 years old, at most" (p. 221). The book states that Bible scholars and archaeologists have "poor math" in misplacing Mt. 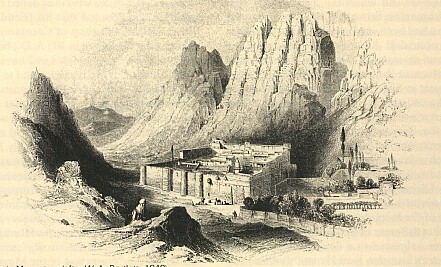 Sinai in the Sinai (p. 71). A "glaring" math error has been committed for "thousands of years" in figuring that the Israelites reached the Red Sea from Goshen in only three days...march (p. 118). This mistake is said to be due to the widespread "assumption" that Moses...request of Pharaoh for three days...journey into the wilderness to worship God (Exodus 5:3; 8:27) also represents the travel time to the Red Sea upon the Israelites...escape. However, the real reason scholars have thought (mistakenly) that it took three days to get to the Red Sea is that the Bible lists three stops (Succoth, Etham, and Pi-ha-Khiroth) and it is assumed each stop represented one overnight rest. (5) But it cannot be simplistically assumed that the Israelites always camped at night since the pillar of cloud that led them by day was a pillar of fire by night "so that they could travel by day or night" according to Exodus 13:21 (emphasis added). Ancient Jewish tradition identifies the eating of unleavened bread in haste for seven days in the Passover (Exodus 12:11-19, 37-39; 13:6-7) as the time occupied in hasty travel to the Red Sea. "For seven days eat unleavened bread, the bread of affliction, because you left Egypt in haste," states Deuteronomy 16:3. If so, the Israelites took seven days to get to the Red Sea. (51) The current book concedes the possibility that the Israelites reached the Red Sea in as little as only "five to seven days." (p. 125). The book states (p. 70, emphasis added): "There is NO mention in any work we have been able to uncover that the land of Midian was ever reputed to be in the Sinai Peninsula. It was always to the east of the Sinai Peninsula across the Gulf of Aqaba, where the Kingdom of Saudi Arabia is now found." The argument is that if Mt. Sinai is in Midian, and Midian is only in Saudi Arabia, then Mt. Sinai had to be in Saudi Arabia, too. But as we have seen, Mt. Sinai and Midian were in two different places according to the Bible (Exodus 18; Numbers 10). The Harper's Bible Dictionary is not correctly quoted in the book to support the idea that Midian was limited to Saudi Arabia (pp. 69-70). The correct quote only refers to the center of Midian as located in Saudi Arabia, as it includes the following capitalized portion omitted from the book under review here: "The Land of Midian (Exodus 2:15) probably refers to the center of the Midianite territory, that part of northwestern Arabia bordering the Gulf of Aqabas eastern shore...." (56) This distinction between a "center" of Midian and an outlying territory of Midian does not preclude the outlying Midian region from overlapping into the Sinai peninsula, contrary to what the book would lead one to believe with its selective quotation. The map in another key source for the current book, the Harper's Bible Commentary, puts "Mt. Sinai (Gebel Musa)" at the traditional spot without the question mark that the book claims is used in almost every Bible atlas (p. 49) -- and without showing any alternative site in Saudi Arabia. The book mentions neither of these facts. Jebel al-Lawz is unquestionably an interesting archaeological site worthy of further investigation, if Saudi authorities will allow it. The identification of this site as the true Mt. Sinai needs to overcome a host of problem areas outlined above. I remain interested in reviewing the evidence for this site and am in the process of gathering further data. © Copyright 1990-2001 by Brad C. Sparks All rights reserved. (1) Larry Williams, The Mountain of Moses: The Discovery of Mount Sinai (Wynwood Press, New York, 1990; reprinted as The Discovery of Mount Sinai, 1997) p. 182. (2) Williams, Mountain of Moses (1990) p. 70. It will be assumed here that the place where Moses fled after killing the Egyptian (Exodus 2), the land of Midian, roughly corresponds to Saudi Arabia's northwest quarter (see PROBLEM NO. 20 regarding some overlap into the Sinai). (3) "Near the mountain of God" (Exodus 18:5). The Israelite camp at Rephidim was literally within a short walking distance of Horeb (Mt. Sinai), where Moses struck the rock to get water (cp. Exodus 17:1, 5-6). Mt. Horeb = Sinai approximately (cp. Exodus 33:6, 34:29-30). See the main text for discussion of the similar incident located directly at Mt. Sinai (Numbers 10). (4) Har-El's book is quoted in Williams, Mountain of Moses (1990) pp. 61, 223. (5) Charles T. Beke, Origines Biblicae (London, 1834) vol. 1, cited in Thomas K. Cheyne, "Exodus" sec. 5, in Cheyne and J. Sutherland Black (eds. ), Encyclopaedia Biblica (Macmillan, New York, 1901) vol. 2, col. 1434. See also Beke, "Egypt not the Mizraim, nor the Gulf of Suez the Red Sea, of Scripture," Asiatic Journal, new series, vol. 13 (1834) p. 258; "On the localities of Horeb, Mount Sinai, and Midian, connexion with the hypothesis of the distinction between Mizraim and Egypt," letter in The British Magazine (1835), cited in Ibrahim-Hilmy, The Literature of Egypt and the Soudan (Routledge & Kegan Paul, London, 1886 [Kraus Reprint, Nendeln, Liechtenstein, 1966]) vol. 1, p. 58. Beke, The Idol in Horeb: evidence that the Golden Image at Mount Sinai was a cone, and not a calf (London, 1871); Mount Sinai a Volcano (Tinsley, London, 1873). (6) Charles T. Beke (ed. Emily Beke), The Late Dr. C. B. 's Discoveries of Sinai in Arabia, and of Midian (London, 1878) p. 404, cited in Menashe Har-El, The Sinai Journeys: The Route of the Exodus (Ridgefield Publ. Co., San Diego, Calif., 1983 rev. Eng. transl.) = [Mase Sinai (Am-Oved Publ. Ltd., Tel Aviv, 1968)] pp. 252, 294 n. 441. Upon his firsthand exploration of the Arabian mountains in 1873-4, Beke seemed to retract his novel thesis of a volcanic origin for the smoke, fire and rumblings on Mt. Sinai, but without repudiating the general Arabian locale. Beke, Sinai in Arabia (1878) p. 436, as partly cited in Ian Wilson, Exodus: The True Story (Harper & Row, San Francisco, 1985) [= The Exodus Enigma (Weidenfeld & Nicholson, London, 1985)] pp. 128, 195. (7) Har-El, Sinai Journeys (1983) p. 250. (7a) See note 3 (above). (8) Williams, Mountain of Moses (1990) pp. 62, 84. (9) Josephus, Against Apion 2:2 [2:25]: William Whiston (transl. ), Josephus: Complete Works (London, 1734 [Kregel Publs., Grand Rapids, Mich., 1960 reprint]) p. 623b; Henry St. J. Thackeray (transl. ), Josephus (Harvard Univ. Press, Cambridge, Mass., 1926) vol. 1, pp. 301-303. (10) Graham I. Davies, The Way of the Wilderness (Cambridge Univ. Press, London, 1979) pp. 51-55. (11) "Exodus" entry, Cheyne-Black, Encyclopaedia Biblica (1901) vol. 2, col. 1434. (12) Beke, The Late Dr. C. B. 's Discoveries (1878) p. 436 as cited in Wilson, Exodus (1985) pp. 128, 195, and in Ibrahim-Hilmy, Literature of Egypt/Soudan (1886) vol. 1, pp. 58-59. (13) Cheyne-Black, Encyclopaedia Biblica (1899-1903). (14) Oded Bustanay, "Exodus," Encyclopaedia Judaica (Keter Publ. House, Jerusalem, 1972) vol. 6, p. 1043; Har-El, Sinai Journeys (1983) pp. 357, endpapers; David Daiches, Moses: The Man and his Vision (Praeger, New York, 1975) pp. 84, cf. 90, 98; Wilson, Exodus (1985) pp. 154, 196; Siegfried H. Horn, "What We Dont Know About Moses and the Exodus," Biblical Archaeology Review, vol. 3, no. 2 (June 1977) pp. 22a-31b at 30, cf. 29a. Har-El's book is quoted in Williams, Mountain of Moses (1990) pp. 61, 223. (15) Williams, Mountain of Moses (1990) pp. 13, 56. (16) Nectarius, Bishop of Sinai at St. Catherine's Monastery ca. 1658, drew on the monastery's vast manuscript collection (which included the now famous Codex Sinaiticus) to write the monastery's official history and he is the authority for Helena's role in building the original church ca. 330. Lina Eckenstein, A History of Sinai (London & New York, 1921 [AMS Press, New York, 1980 reprint]) pp. 99 fn. 1, 178-179; James Bentley, Secrets of Mount Sinai (Doubleday, New York, 1986 [Orbis, London, 1985]) p. 58; Edith Deen, Great Women of the Christian Faith (Harper & Row, New York, 1959 [Barbour & Co., Westwood, N.J., reprint]) pp. 7-10. (17) Bentley, Secrets/Sinai (1986) p. 58; Eckenstein, Hist. Sinai (1921) p. 99. (18) Contrary to the arbitrary dating of Justinian's accession in 527 that is sometimes cited, the monastery must have been built after Empress Theodora died in 548 as a roof inscription still extant is dedicated to her posthumously (Bentley, Secrets/Sinai, pp. 64-67). Justinian's building activity began ca. 535 and a decree of Justinian dated to 551 guarantees political independence of the monastery (Eckenstein, Hist. Sinai, pp. 121-122, 177). Though the decree is probably an ancient forgery, it nevertheless may reflect early information on the construction date of the monastery. (19) Eckenstein, Hist. Sinai (1921) p. 147. A SHRINE for St. Catherine on an elevated portion of Mt. Sinai (Jebel Musa) had been mentioned as early as ca. 1096 (ibid., p. 140) but the name evidently was not yet applied to the MONASTERY itself, located in the wadi next to Mt. Sinai. (20) Davies, Wilderness (1979) pp. 63, 109. (21) Davies, Wilderness (1979) pp. 14-28, esp. 23-24. (22) Paul J. Achtemeier (ed. ), Harper's Bible Dictionary (Harper & Row, New York, 1985) p. 957, emphasis added. (23) Eckenstein, Hist. Sinai (1921) pp. 98-101, 104, 119; Davies, Wilderness (1979) pp. 100-101 n. 23; John Wilkinson, Egeria's Travels to the Holy Land (Aris & Phillips, Warminster, Eng. & Ariel Publ. House, Jerusalem, 1981 rev.) pp. 29, 237-239; see A. Thomas Kraabel review in BAR, vol. 9, no. 2 (March/April 1983) pp. 20-23. Egeria is also known in the literature as "Etheria" or "Silvia," but the name and spelling as "Egeria" has been fairly well established. George E. Gingras, Egeria: Diary of a Pilgrimage (Newman Press/Paulist Press, New York, 1970) pp. 6-7; Wilkinson, Egeria's Travels, pp. 235-236. (24) Davies, Wilderness (1979) p. 42. (25) Alan H. Gardiner, William F. Albright, Edouard Naville, and others, cited in: John Van Seters, The Hyksos (Yale Univ. Press, New Haven, Conn., 1966) pp. 148-149; Gingras, Egeria, pp. 21-23, 149-150 nn. 96-102, 183 n. 103; Wilson, Exodus, p. 47; John Bimson, "Exodus and Conquest-Myth or Reality?" Journal of the Ancient Chronology Forum, vol. 2 (London, 1988) pp. 37, 39; Itzhaq Beit-Arieh, "Fifteen Years in Sinai," BAR, vol. 10, no. 4 (July/August 1984) p. 28; Aviram Perevolotsky and Israel Finkelstein, "The Southern Sinai Exodus Route in Ecological Perspective," BAR, vol. 11, no. 4 (July/August 1985) pp. 28-32. (26) Davies, ibid., pp. 40, 43, 46; Eckenstein, Hist. Sinai (1921) pp. 93-94, 115; Wilkinson, Egeria's Travels (1981) pp 28-29, 100-101, 205-207. Etymology of "Clysma": J. Rendel Harris and Arthur T. Chapman, "Exodus and Journey to Canaan," in Hastings, Dict. of the Bible (1898) vol. 1, p. 803b; Joseph Henry Thayer, Greek-English Lexicon of the New Testament (Associated Publs., Grand Rapids, Mich., reprint 1889 rev.) pp. 332a, 350b. (28) Telephone interview with John D. Morris, ICR, Oct. 26, 1990; Morris, "The Search for Noah's Ark: Status 1992," Impact, no. 231 [Acts & Facts, vol. 21, no. 9] (Sept. 1992) p. iii. (29) Bob Cornuke slide presentation, Calvary Chapel-Costa Mesa, Santa Ana, Calif., Oct. 25, 1990 (tape transcript). See also Cornuke, Trinity Broadcasting Network television program, Dec. 18, 1991 (audio tape available from TBN, Tustin, Calif.). (30) Also Williams, Mountain of Moses (1990) p. 123 (to go "out of Goshen" is to go "OUTSIDE OF EGYPT"), emphasis added. (31) John Bright, A History of Israel (Westminster Press, Philadelphia, 1959) pp. 114-115. (32) Louis Grollenberg, Atlas (Thomas Nelson, London, 1956, 1965) p. 51. (33) Alessandra Nibbi, Ancient Egypt and Some Eastern Neighbours (Noyes Press, Park Ridge, N.J., 1981) pp. 1-5, 9, 11; William H. Stiebing, Out of the Desert? (Prometheus Books, Buffalo, N.Y., 1989) pp. 184-186. Samuel C. Bartlett, From Egypt to Palestine (Harper & Row, New York, 1879) pp. 270-272, as cited in Wilbur Fields, Exploring Exodus (College Press, Joplin, Missouri, 1976) p. 394; Eckenstein, Hist. Sinai (1921) pp. 118, 122-123. (35) Eckenstein, ibid., pp. 6-7, 39-40. (36) Ibid., pp. 6-7, 90-91, 160. (37) R. Laird Harris (ed. ), Theological Wordbook of the Old Testament (Moody Press, Chicago, 1980) vol. 2, pp. 558-559 (no. 1309); Gesenius Lexicon, p. 536 (Strong's no. 5090). (38) Josephus, Antiquities of the Jews 6:7:3 ; edition of Henry St. J. Thackeray and Ralph Marcus (transls. ), Josephus (Harvard Univ. Press, Cambridge, Mass., 1934) p. 237. See also Eckenstein, Hist. Sinai, p. 45. (39) Cornuke presentation, Oct. 25, 1990 (tape transcript). Cf. Williams, Mountain of Moses (1990) pp. 77-79. See also Cornuke, TBN television, Dec. 18, 1991 (audio tape). (40) Telephone interview with John D. Morris, ICR, Oct. 26, 1990; Morris, "Search for Noah's Ark," Impact [Acts & Facts] (Sept. 1992) p. iii. (40a) Bob Cornuke telephone interview, Dec. 30, 1996. (41) Flash floods at St. Catherine's or southern Sinai generally: Eckenstein, Hist. Sinai (1921) pp. 5-6; George H. Forsyth and Kurt Weitzmann, "Saving the Mt. Sinai Mosaics," BAR, vol. 4, no. 4 (Nov/Dec 1978) p. 20. (42) Egeria 2:2, 4:4; Eckenstein, ibid., pp. 117-118; Gingras, Egeria (1970) pp. 50, 54-55; Wilkinson, Egeria's Travels (1981) pp. 91, 95-96. (43) Bentley, Secrets/Sinai (1986) p. 58, emphasis added. (44) Eckenstein, Hist. Sinai (1921) p. 151; Bentley, ibid., p. 67. (46) Avraham Negev, "Understanding the Nabateans," BAR, vol. 14, no. 6 (Nov/Dec 1988) pp. 32, 34. (47) Davies, Wilderness (1979) pp. 49, 106 n. 2, 110 n. 17. (48) Eckenstein, Hist. Sinai (1921) pp. 81-82. Arab historian Masoudi ca. 951 A.D. disputed this identification of Shoeib with Jethro. (50) Exodus 12:37; 13:20; 14:2; Numbers 33:3-8. See Keil-Delitzsch, Comm. Exodus (1878) pp. 26-27 (on Exod. 12:37-42). (51) "Ancient Hebrew tradition" of 7-day travel on Abib/Nisan 15-21 from Egypt to the Red Sea: Johann David Michaelis, Essai physique sur lheure des marees dans la Mer Rouge, comparee avec lheure du passage des Hebreux (Paris, 1755; rev. Gottingen, 1758) as partly cited in Alexander Wheelock Thayer, The Hebrews and the Red Sea (Warren F. Draper, Andover, Mass., 1883) p. 11 fn. 1; see also Howard B. Rand, Primogenesis (Destiny Publishers, Haverhill, Mass., 1953) pp. 166-167, as quoted in John J. Davis, Moses and the Gods of Egypt (Baker, Grand Rapids, Mich., 1986 rev.) p. 174; Fields, Exploring Exodus (1976) pp. 260, 289 (3 days to Succoth then 4 days to Red Sea). (52) Josephus, Antiquities of the Jews 6:7:3 ; Thackeray-Marcus, Josephus (1934) p. 237. (53) Eckenstein, Hist. Sinai (1921) p. 81; Davies, Wilderness (1979) p. 46. (54) Grollenberg, Atlas (1965) pp. 44, 157; G. Ernest Wright and F. V. Filson, Westminster Historical Atlas (Westminster Press, Philadelphia, 1956 rev.) p. 33; James Hastings (ed. ), Frederick C. Grant and H. H. Rowley (rev. eds. ), Dictionary of the Bible (Scribner's, New York, 1963 rev.) map 5; Negev, AEHL (1986) p. 262. (55) Ibid. ; Martin Gilbert (ed. ), Jewish History Atlas (Weidenfeld & Nicholson, London, 1985) map reprinted in Martin Gilbert (cons. ed. ), Illustrated Atlas of Jewish Civilization (Macmillan, New York, 1990) p. 15. (56) Achtemeier, Harper's Bible Dict. (1985) p. 634. Harper's next sentence confusingly talks about the Midianites roaming "far beyond this ancestral homeland" as far as the "Sinai," which might suggest to a cursory reader that the Sinai was outside of Midian but apparently means the Sinai was outside of the ancestral "center of Midianite territory." However, there is no Biblical basis for distinguishing between a central Midian and an outer Midian. (57) Ibid., p. 957; James L. Mays (gen. ed. ), Harper's Bible Commentary (Harper & Row, San Francisco, 1988) map 2. Addendum: Prof. K.A. Kitchen addresses the possible routes of the Exodus and the overwhelming evidence that the traditional location at the South end of the Sinai Peninsula is correct. See his new book, On the Reliability of the Old Testament, Wm. B. Eerdmans, Grand Rapids, 2003. See especially pages 241-274. Route Maps, from K.A. Kitchen. Another Traditional route map with major place names. (added 3/18/04). Online version created January 30, 1997. Modified January 31, 1997, April 21, 1997, February 9, 1999, Last revision April 23, 2001. Formatting changes: Thursday, February 6, 2003. January 1, 2004. April 17, 2004. October 7, 2004. March 24, 2005. April 2, 2005. August 7, 2006.